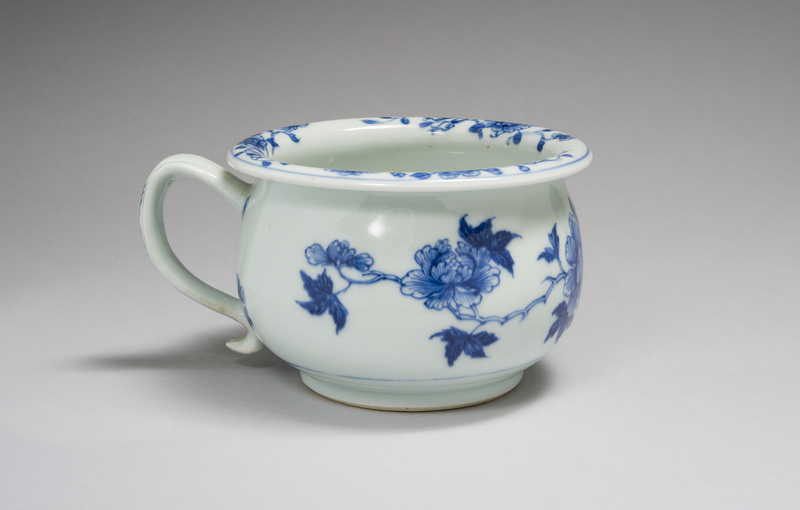 Both the Tankard and Vomit Pot with Floral Decoration are items exported from China by the Dutch East India Company (“Blue and White Wares”). The artists are unknown (Ackland Art Museum, 21 – 22). The shapes of the items were likely to have been commissioned by Europeans. That is, the shapes are not original to China (“Blue and White Wares”). Both are made from porcelain (Ackland Art Museum, 21 – 22). The Tankard is decorated with “iron red” and gold, whereas the Vomit Pot with Floral Decoration is decorated with a cobalt blue underglaze (Ackland Art Museum, 21 – 22). Both are decorated florally, with delicate stems connecting the flowers to one another. The Vomit Pot with Floral Decoration is very likely from the Geldermalsen, a Dutch East India Company ship that wrecked in 1752 (“Blue and White Wares”). The vomit pot is considered a rare item; it is even thought that most vomit pots currently in existence are from the Geldermalsen (“Blue and White Wares”). Although it was speculated that they were used as chamber pots for young children, the consensus seems to be that they are more likely to have been used in the way suggested by their name (“Blue and White Wares”). That is, they were used to contain the vomit of a person who had perhaps eaten too much at dinner (“Blue and White Wares”). 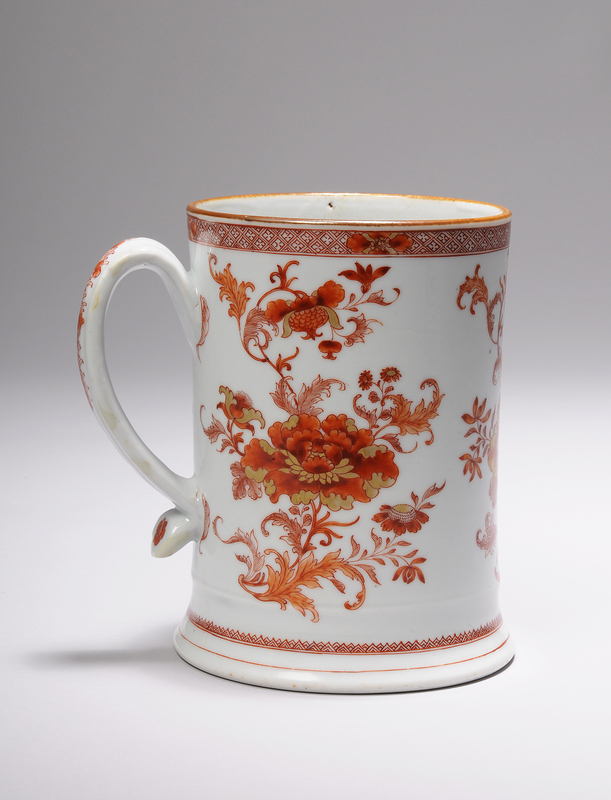 In contrast to the Vomit Pot with Floral Decoration, the Tankard was used for drinking. It is likely to have been used for beer (“Tankard,” and Sawinski). The juxtaposition of the two objects represents a unique perspective on the feast. This perspective is that we should not only tolerate excess. Rather, we should treat it as just as essential to feasting as is eating or drinking. Although the origins, materials and decorations of the pieces are very similar, their uses are quite opposite. In fact, it is not difficult to imagine a situation in which both are used in the very same night. Someone might drink a lot of beer out of a tankard and then become sick as a result. The person would then resort to using the vomit pot. The vomit pot is an interesting object because it involves the recognition of ones own lack of self-control. That is, unless vomit pots were used exclusively for those with stomach ailments such as viruses or food poisoning, they were owned with the expectation of eating or drinking too much. It seems unlikely that such an ornate object would be reserved only for the very sick, so they were probably used for casual eating and drinking to excess. If used in a public setting, this lack of self-control would be on display to all others in attendance. Rather than being a point of shame, it is symbolically held in the same esteem as the drinking of beer, for example, because the vessels for each are equally ornate. In fancy contexts, we dine with fine utensils and dishes. It is thus not surprising that the Tankard is beautifully decorated. However, it might strike us as unusual that a vessel used to contain vomit should be equally ornate. Vomiting is, after all, not something that is usually considered pretty. However, it can be made pretty in the sense that it can be recognized as part of the feast rather than something that happens separately from the feast. This is the suggestion of the paired items; they stand on equal ground with one another, for they are equally ornate. Milwaukee Art Museum. Milwaukee Art Museum, 24 June 2014. Web. 19 Apr. Tankard. [c. 1720 CE]. Porcelain. Ackland Art Museum, Chapel Hill.